When I was a kid, I gobbled up books like the Sweet Valley High series and anything by Judy Blume. I’d lose myself in the characters’ lives, imagining what it’d be like to kiss my one true love or figure out my life before going to college. But somewhere along the way, it became uncouth to seek out these books. Sure, it was okay to read Jane Green or Helen Fielding, as long as the books that surrounded them on your shelves were deeper literary fiction. You know, REAL literature. If you were going to read a book on public transportation, Khaled Hosseini trumped Sophie Kinsella any day. But I never stopped loving the happily ever after. I’ve read most of Nicholas Sparks’ books (and seen the movies) but those aren’t the novels I’d discuss with fellow book lovers. If books came up in conversation I’d name-drop the bestsellers of the day, but in the privacy of my home I’d devour Jennifer Weiner and Emily Giffin. All that changed when I started reading young adult novels. While the plots are as varied as anything you’ll find in adult literature (and they certainly don’t all end happily), YA novels don’t shy away from the idea that things might work out in the end. Even in the darkest YA, there’s usually a glimmer of hope that while things may not end perfectly, they will get better. And I don’t know about you, but I could usually use a little hope at the end of the day. 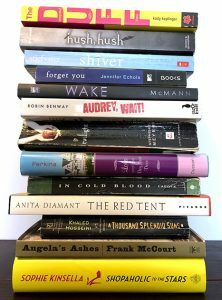 Soon I discovered Stephanie Perkins, Lisa McMann, and shelves full of authors who don’t shy away from happiness, and I slowly stopped caring what other people thought of my reading choices. There have been countless articles arguing that YA lit somehow isn’t as good as adult lit, and while I won’t get into that debate here (although I think it should be clear where I stand), I think what really matters is that you read what you enjoy. If you love horror or thrillers or non-fiction adventures, read those! And own it. Don’t hide your true joy in a dark kindle. Life’s too short for that. I still read the occasional adult novel — even ones without happy endings — but YA happily ever afters hold my heart and I’m no longer afraid to admit it. Linda Budzinski: I heard the other day about a poll in which snuggling by a fire was ranked as the best date. I have to admit, that’s pretty good, especially if it involves hot chocolate with Kahlua and marshmallows, but for me, the perfect date involves getting out and doing something fun. This could mean Frisbee golf, putt putt, bowling, skating, darts (and have I mentioned I like escape rooms?). For Valentine’s day, I bought a curling lesson for my husband and me. We are both super excited to try it. It looks a little bit like bocci on ice, and we both love bocci! Hmm. Maybe afterward, there could be snuggling by a fire…. Stephanie Scott: To be honest, my date nights have increasingly become staying in to watch Netflix and order take out. While I love this, a night in is a bit lacking in adventure! I like the idea of being a tourist in your own town. I recently discovered an independent bookstore only a few miles from me that I never knew existed. Checking out a new restaurant, an art exhibit, or a park in a nearby area helps me appreciate where I live. Sharing that with a special someone is even better. Melanie Hooyenga: My perfect date involves good food and drink, lively conversation, and excellent scenery. I live less than a mile from Lake Michigan, so it’s pretty much a requirement that a date includes either driving by the lake or walking on the pier, and since we’re also thirty minutes from Beer City USA (Grand Rapids, MI) there’s a good chance a brewery will be involved. But really, the more I can be outside, the better, so a picnic near the lake is my ideal. Recently, my husband and I were at a brewery and pretended we’d just met, so when we went to dinner afterwards we acted like it was our first date. We asked all the getting-to-know-you questions that you take for granted once you’re married, and it was fun experiencing the butterflies I often write about but haven’t experienced in years. Karole Cozzo: Coming off of a Disney trip (with kids), I think a pretty perfect date would be an evening in the World Showcase at Epcot. Margaritas in Mexico or lager and a soft pretzel in Germany to start the night, dinner in Italy, and a late night stroll through France, complete with a stop at L’Artisan des Glace for gelato or an ice cream martini to cap the night. Right now, with warm breezes and the flower and garden festival going on, I can’t think of a better evening — a date where you get to travel the world in a single night! Robin Constantine: Hmmm…I love going to the movies, but I think for a date it would be better to do something active like hitting the boardwalk at the Jersey shore to play games, sample the food, sit on the beach and take in the sunset and people watch or go for a hike in a local park, maybe even one with a little bit of history — some activity that is conducive to shared experience, to take the pressure off “having to talk,” like if you were sitting across from each other at dinner. Nothing like an awkward silence to kill the romance! Erin Fletcher: My perfect date (besides April 25th, of course … bonus points if you get that reference!) would be a new experience. Something like visiting a new art museum, taking a cooking class, or exploring a hiking trail. New experiences always lead to great conversation, learning about each other, and having a lot of fun. And if the date can somehow include coffee and/or ice cream, that would be even better! What is your recipe for a perfect date? 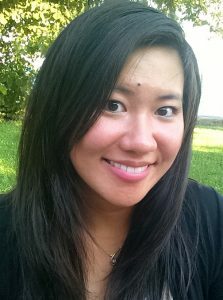 Congratulations to this month’s guest author, Gloria Chao, whose debut novel, AMERICAN PANDA, released last week! In this YA romance — called “effervescent” by Publishers Weekly — 17-year-old Mei Lu’s parents want her to become a doctor and marry a Taiwanese Ivy Leaguer. Two problems: Germs freak her out, and dreamy Darren Takahashi is not Taiwanese. Ah, forbidden love! How did you come up with the idea for AMERICAN PANDA? I wrote this book when I switched careers from dentist to writer and was having a hard time communicating with my parents. I wanted to write the book that I needed in that moment and also the book I needed as a teen. Just like my protagonist, Mei, I had a different vision for my life than my parents, and I needed to find the strength to pursue my dreams and communicate with my parents. How did you find your agent and publisher? Was your manuscript an overnight success, or did you have to deal with a lot of rejections/revisions? It took me a little over a year (and many, many rejections) to find my wonderful agent. I rewrote the book so many times because of the college setting and queried 3 different versions of the manuscript. After revising a few rounds with my agent, we went out on submission and sold the book in a week! What is the significance of the title? Did you come up with it, or did the publisher? 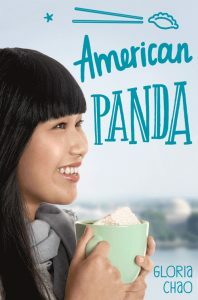 AMERICAN PANDA represents Mei’s struggle with her identity, and the font on the cover even shows how they are in conflict with each other. Mei also starts the book with a black-and-white world view, and through the course of the book, she begins to see the gray. Hence the book’s tagline, “Unlike the panda, life isn’t always so black and white.” There are also references to pandas in the book. I came up with this title, and I’m thrilled that Simon Pulse loved it! You were once a black belt … what could kung fu teach you about writing? Kung fu taught me to grit my teeth to push through the pain. Also, the more I practiced, the easier it became. Both of these are very applicable to writing! And fun fact: my second book’s protagonist is a martial artist! How did you celebrate your release? I was honored to have visited South Elgin High School the morning of release to hold a writing workshop and give a presentation. The rest of the day was my husband and I driving around to Targets, indie bookstores, and Barnes and Nobles to sign stock! It was surreal seeing my book on the shelves, and I’m grateful to have been able to share the moment with the person who helped me discover my love of writing. There was a lot of driving (and singing at the top of our lungs), and then that night we celebrated with a launch party at Anderson’s Bookshop! There was laughter, hugging, cake, and panda plates, and I couldn’t have wished for anything more. I am also so grateful for the love that AMERICAN PANDA received on social media that day! Thank you, everyone, for making my launch day so special! I’m currently drafting MISALIGNED, which will be out fall 2019 with Simon Pulse. The book follows a teen outcast, Ali, who is the only Asian in her small, predominantly white Midwestern town. The book explores racism and prejudice, and when another Asian family moves to town, everyone believes Ali and the other Chinese boy belong together. 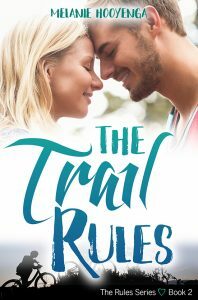 Despite her initial resistance, she begins falling for him, only to learn that her mother forbids them from being together. As Ali searches for the reasoning behind her mother’s disapproval, she unearths dark family secrets that threaten her future. Ah, who doesn’t love family secrets? And more forbidden love? Okay, on to the speed round! Tropical island or mountain getaway? Ooh, tropical island relaxation. French fries or cookies? COOKIES!!!!! High heels or flats? Flats—I am all about comfort over style. One of the challenges of writing contemporary young adult is the ability to keep things fresh, current. Use a word or an action that’s out of date, and you’ll be sent down a shame spiral, or worse, called…old. And yet, if you use tech or slang that is too current, too new — you risk the chance of it being considered antiquated by the time your book comes out. What’s a YA writer to do if you don’t want your story to be as outdated as MySpace? 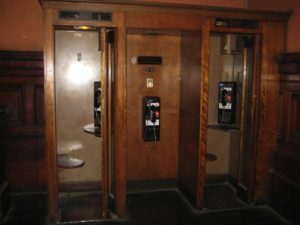 There’s actually more than just the advent of cell phones that lead to the demise of the phone booth/pay phone! Apparently, they were very conducive to criminal activity. Also … I’ll try not to think of all the germs I was probably exposed to … blech, not to mention the broken heart when said crush fizzled out. Passing Notes in Class. You think sending a clandestine text is hard? That’s nothing compared to the slight of hand required to pass a note. First, one must write said note … then fold it silently … then …the actual passing. What if your friend was across the room? Bonus points if your note contained some boxes that needed to be checked — then there would have to be a return. Oh the anxiety! And if it ever got into the wrong hands … plot twist. Personal Jesus to keep the recipient guessing your intentions. …and yet, with the advent of classroom Chromebooks and online text books, these too are becoming obsolete. Some schools are even getting rid of them so there’s more space. But what do kids do with all their stuff? And what about all that cute paraphernalia to decorate it? 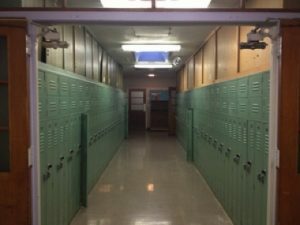 Will the locker chandelier be obsolete soon too? Has anyone ever used one of those? Waiting for an arcade game — Remember walking up to Ms. Pacman and placing your quarter down to show that you were next? Um, yeah, me neither. Who needs to do that when you have an arcade in the palm of your hand? While this list makes me slightly nostalgic, I think there are great new ways to incorporate modern tech into your plot and setting. Out with the old and in with the texting, Skyping, and selfies! **I went to an all girl high school, our brother school was on the opposite side of town … talk about antiquated. ***which is also disappearing in favor of dry erase and smart boards! Have I forgotten anything? What would you add to this list?